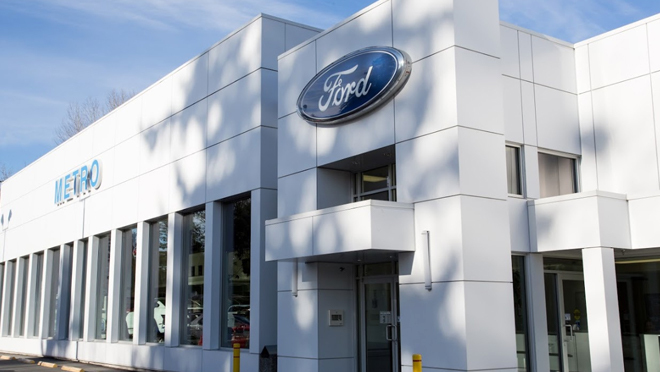 When Metro Ford learned it could save more than it would spend to light its lots with new outdoor LED fixtures, the Port Coquitlam based auto dealer struck a sweet deal with Metcalfe Lighting. Lighting in a car dealership is extremely important for a few reasons, dealerships have a lot of inventory, so they’ve got to make sure the vehicles are safely displayed outside. Secondly, dealerships use lighting to capture your attention as you’re driving by. And third, the light must represent the color of the vehicle properly. A lot of lights out there can make a car’s color look wrong especially high pressure sodium fixtures with their yellow colour which are currently installed at the location, and that really affects the customer experience in a very bad way. LED Area Light fixtures drawing between 150 and 437 watts will replace predominantly 400- and 1,000-watt high-intensity discharge (HID) and high-pressure-sodium fixtures at the Metro Ford dealership. Our comprehensive outdoor LED lighting solution includes pole-mounted fixtures and wall packs attached to buildings, bathing the lots in crisp, white, uniform light. Metro Ford’s five-year lighting expense will be discounted by nearly $126,120 as the result of using 205,000 fewer kilowatt hours (kWhs) while virtually eliminating upkeep for years to come. Combining energy and maintenance reductions, the lighting swap will save Metro Ford nearly $25,000 a year (based on a $0.11 kWh rate and 12 hours of operation a day). After Phase 1 of the LED lighting upgrade at Metro Motors, this commercial LED project helped save a total of 205,000 kWh of energy annually. Metro Ford – Metro Motors Ltd.